Diatomaceous earth is a chalky, sedimentary rock comprised of the skeletal remains of microscopic water plants called diatoms. When the life cycle of these single-cell organisms is completed, the diatom organic matter decomposes and washes away, and the siliceous skeletons become an inorganic mineral and form a sedimentary deposit. 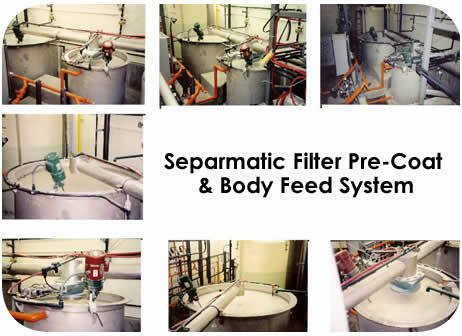 The diatomaceous earth Separmatic uses in our filtration systems receives extensive evaluation prior to mining and processing. The raw materials are analyzed for both chemical and physical properties and are controlled to exacting specifications prior to use. The diatomaceous earth product is drilled, milled, classified, and calcined to purify it. The product is further classified to produce a tightly controlled porosity and permeability that assures the water treatment plant operator of consistent performance, time after time, gallon after gallon. The level of protection afforded by Diatomaceous filtration exceeds the current and anticipated USEPA log separation requirements for protozoan pathogens and further reduces the need for disinfection. DE filtration technology was developed specifically for potable water filtration during WWII, and today there are hundreds of water treatment plants in the United States that use DE filtration for the production of high-quality, low cost drinking water from both surface and groundwater sources. DE filtration has demonstrated the ability to outperform all other media filtration technologies for the separation of cryptosporidium parvum and Giardia lamblia—two pathogens known to be responsible for serious outbreaks of waterborne diseases—from portable water. Additionally, DE filtration consistently delivers low turbidity finished water, even when challenged by spikes caused by storm runoff or recreational activity in the source water supply. Capital costs for DE plants are lower than those for slow sand plants due to much lower space requirements. 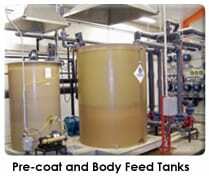 In addition, they are as much as 40-60% lower than cost for rapid sand plants because they do not require extensive pre-treatment facilities or complex coagulation chemistry. DE filtration costs are significantly lower than the capital, operation, and maintenance costs for membrane plants.